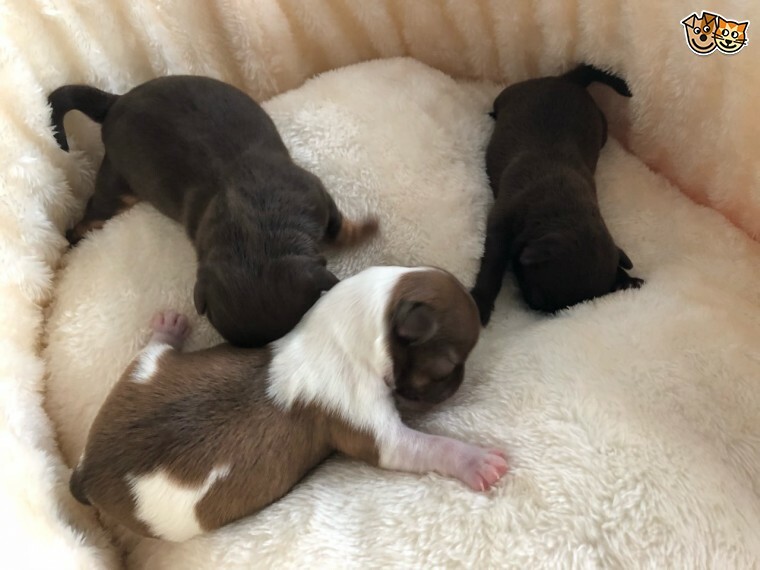 Fantastic quality chocolate chihuahua puppies for sale Sir is long coat chocolate Kennel Club registered Milaya Kroha Denver imported from top kennel in Russia..Denver has great pedigree that includes some of the best chi in Europe .Milaja Kroha Stivi .CH BLR.. Misty Meadow..s Canto Magico. Milaja Kroha Jean Batist. Milaja Kroha Chezaro.. His doing really well in show ring . all show certificates can be seen.. Our boy has a sound temperament. he is great around children and other dogs. .Dam is our chocolate short coat KC registered Choco. She is beautiful show potential girl very true to type with her short muzzle. apple dome head and compact body . Puppies comes with .microchip. .5 generation pedigree . .vaccinated. .puppy contract. .puppy pack. ..Missy.Chocolate.brown.white long coat girl ..Misty.Solid chocolate short coat girl. ..Mocha.Chocolate.tan short coat girl. Viewing from 10th of October. .200 will secure puppy of your choice. They will be ready 14th of November.